The first thing I notice upon arriving are the smells: the salt ocean air, fresh cut grass, a whiff of wood smoke. 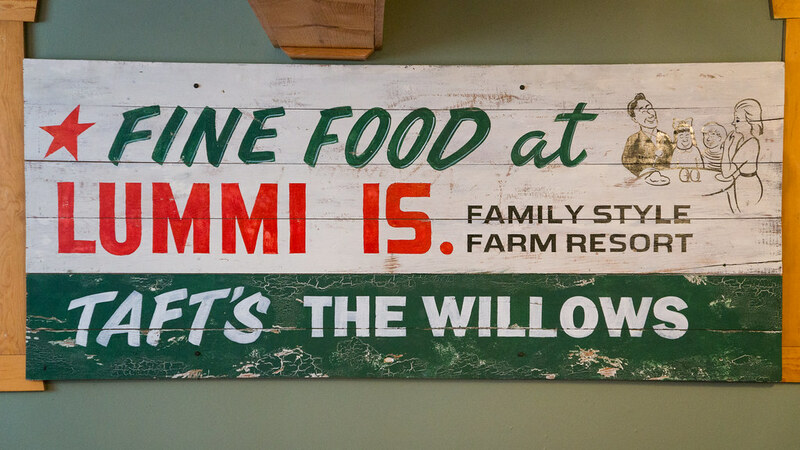 The ferry ride from the mainland takes only about ten minutes, but Lummi Island - the home of the Willows Inn - seems almost a world to itself. 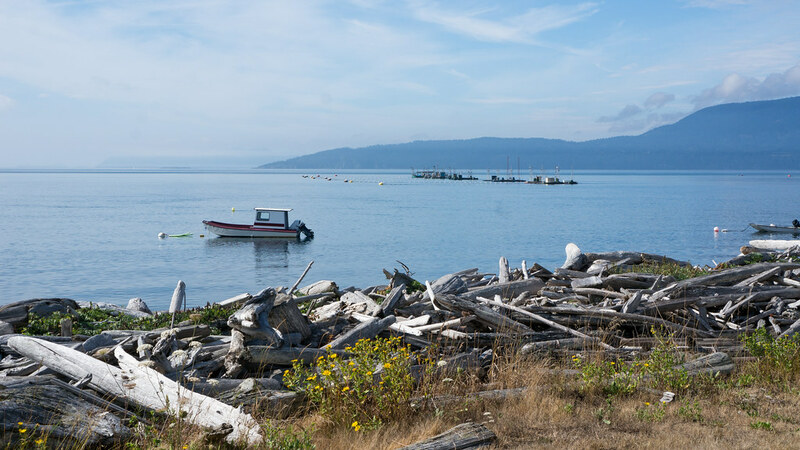 Lummi, about a dozen miles from end to end, is the easternmost of the San Juan Islands, an archipelago in the Strait of Juan de Fuca stretching between mainland Washington State and Vancouver Island. It's also one of the more beautiful places I've ever been. 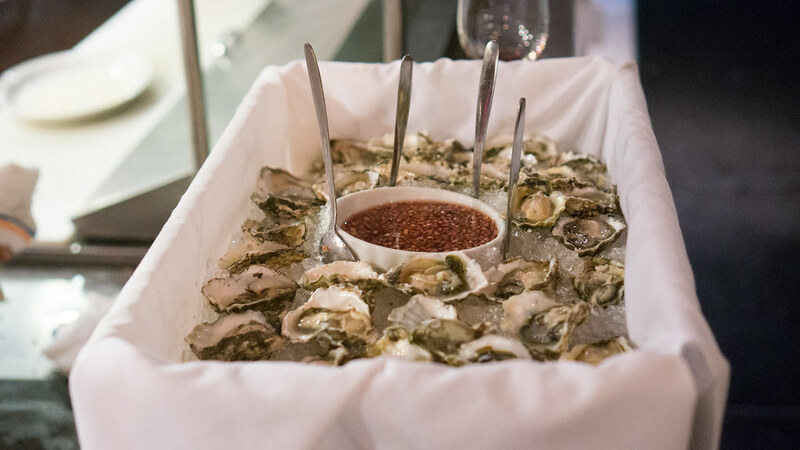 We spent a couple days on Lummi Island before eating at Willows Inn, and I'm glad we did. We saw the reefnets where salmon are fished in the same way that Native Americans did it centuries ago. We caught (and released) a massive thirty pound lingcod. We kayaked along the island's coast, tasting bull kelp and sea lettuce we pulled right out of the water alongside our boats. 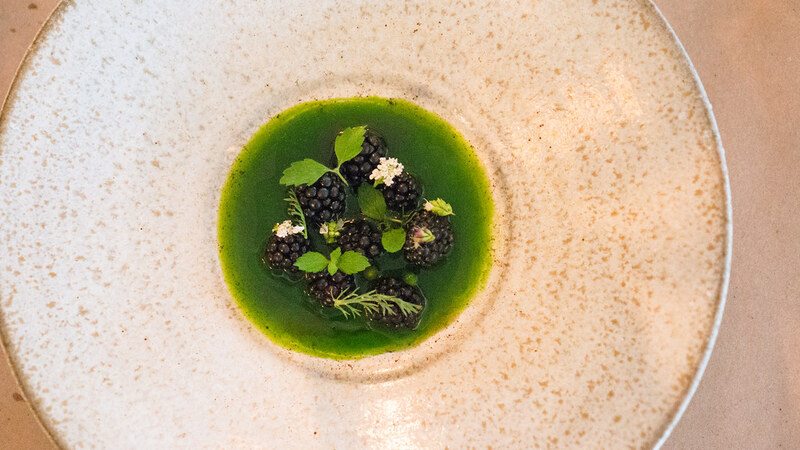 After a little while, it starts to seem as if the entire landscape is edible: blackberry bushes flourish everywhere, salmon occasionally jump over the waves, their scales glinting silver in the light, deer and rabbits roam out of the woods at dusk. It provided context. 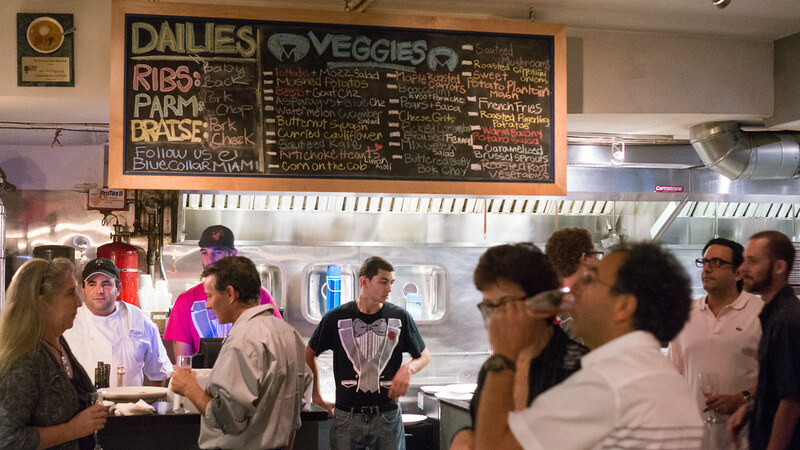 And perhaps more than anything else, Chef Blaine Wetzel's cooking is all about context. 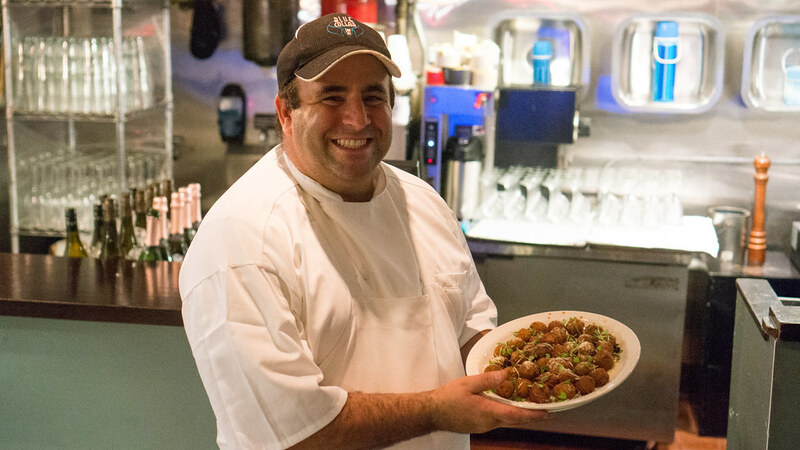 The best meals not only nourish and satisfy; they tell a story. 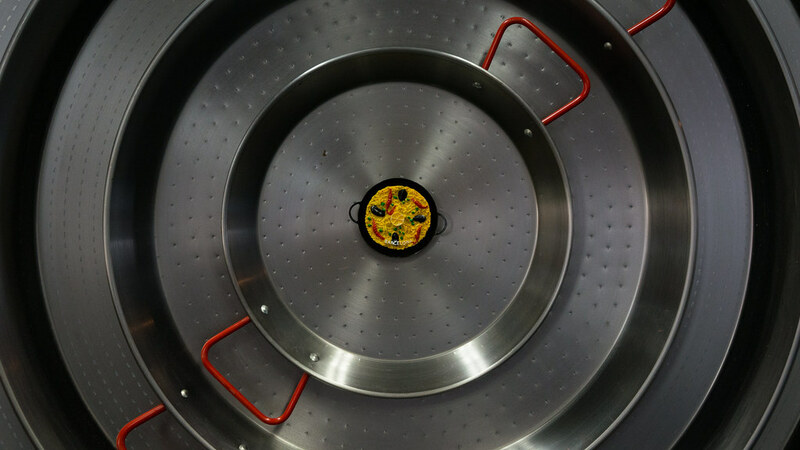 It doesn't need to be a complicated one - and indeed, when your mode of communication is a plate of food, it probably can't be. 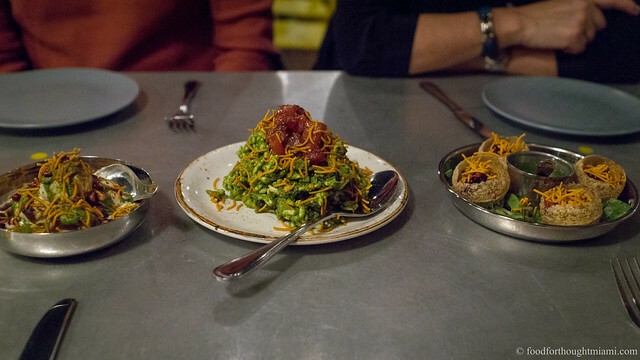 The story of Willows Inn is a simple one, eloquently told: "Here is where you are, right now." This is the story of Willows Inn, and Lummi Island, on August 15, 2013. 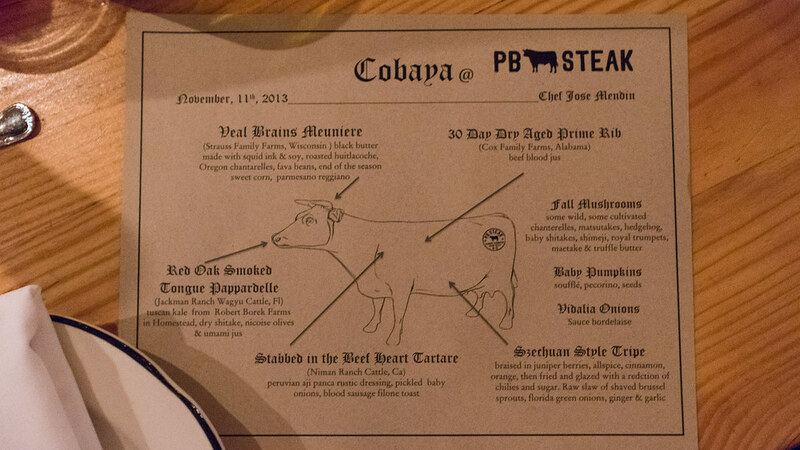 It's always interesting to see how chefs approach doing a Cobaya dinner with us. 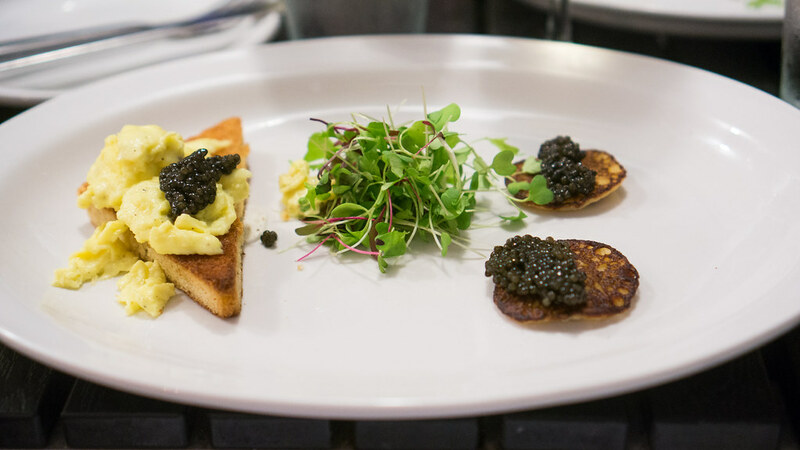 Having a "theme" is entirely optional, but many chefs choose to do so. 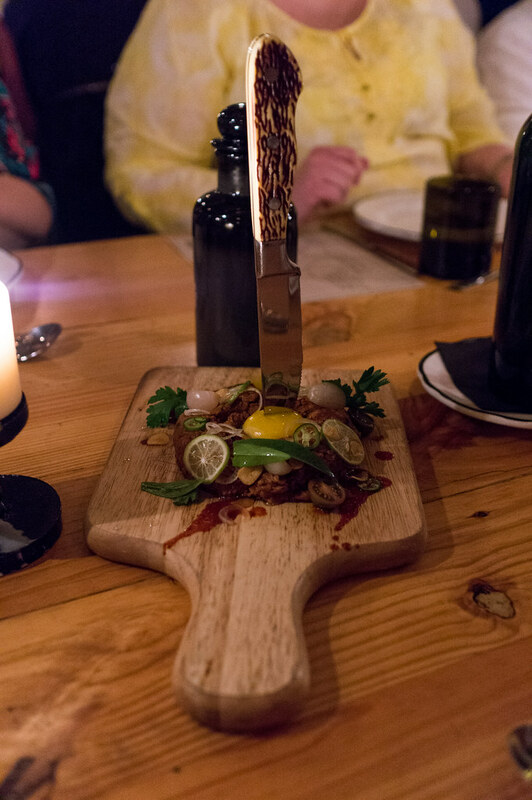 When we lined up a dinner with Chef José Mendin, of Pubbelly and its sibling PB Steak, he went with a "Bloody Monday" motif. 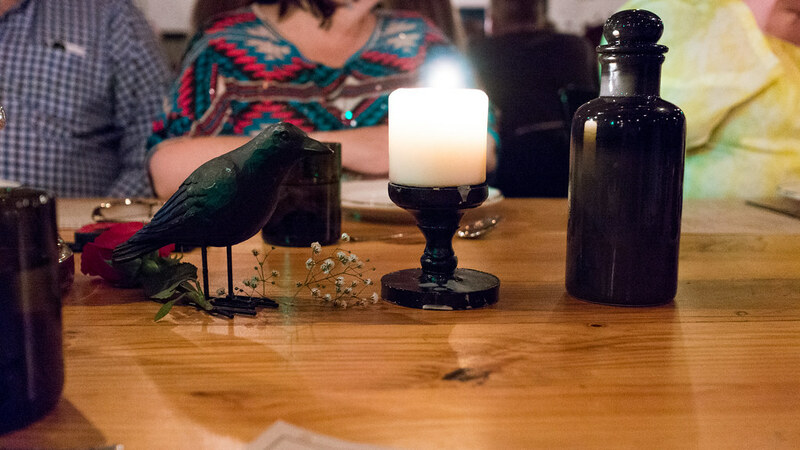 The decorations seemed inspired equally by a butcher's abattoir and a goth chick's boudoir,with PB Steak's unfinished wood and concrete dressed up with lots of candles, black apothecary bottles and the occasional crow. Chef Mendin's offal-intensive menu, making extensive use of the "fifth quarter" of the cattle whose prime cuts usually grace the restaurant's menu, was drawn up like a butcher's diagram, though the pieces actually came from several different places - beef heart from Niman Ranch in California, veal brains from Strauss Farms in Wisconsin, tongue from Jackman Ranch in upstate Florida, prime rib from Cox Family Farms in Alabama. 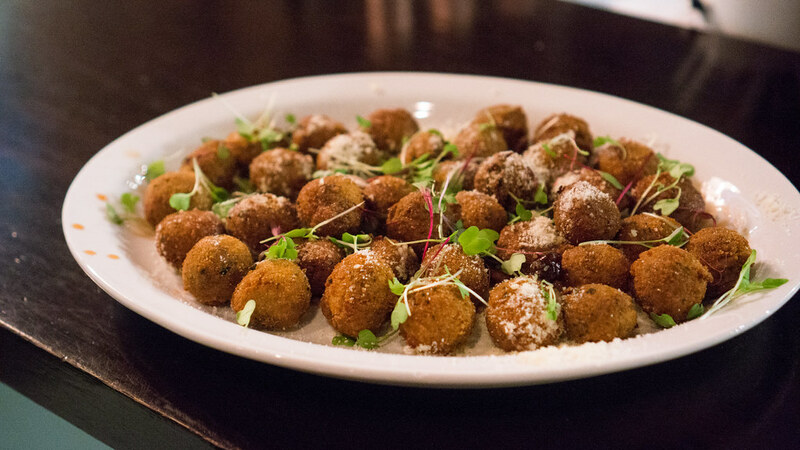 According to Penelope Casas' excellent book "Tapas: The Little Dishes of Spain ," the original tapa was a slice of cured ham or chorizo, served compliments of the house, and - according to some - placed over the top of the customer's wineglass to keep flies out of the sherry. 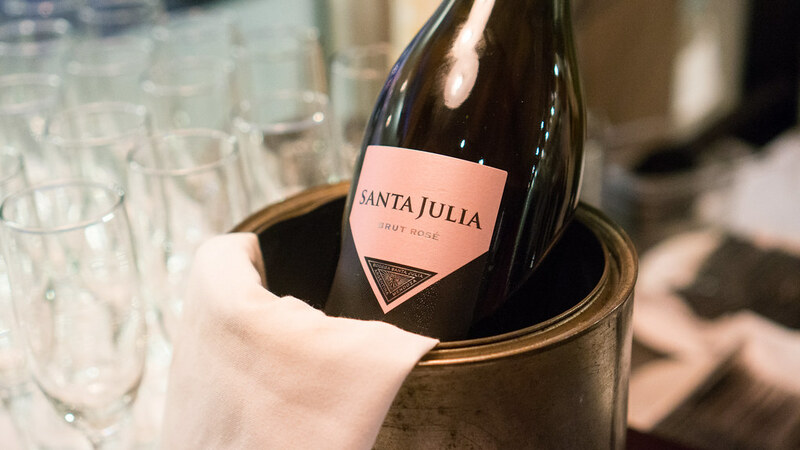 In other words, it was a simple, effective, and delicious confluence of food and design. 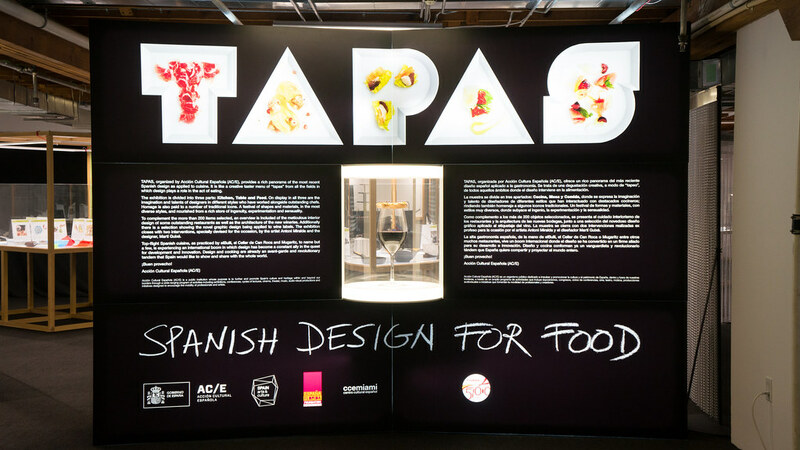 The exhibition "Tapas - Spanish Design for Food," currently on display at the Moore Building in the Design District, explores and celebrates that confluence, using Spanish tapas as the springboard. 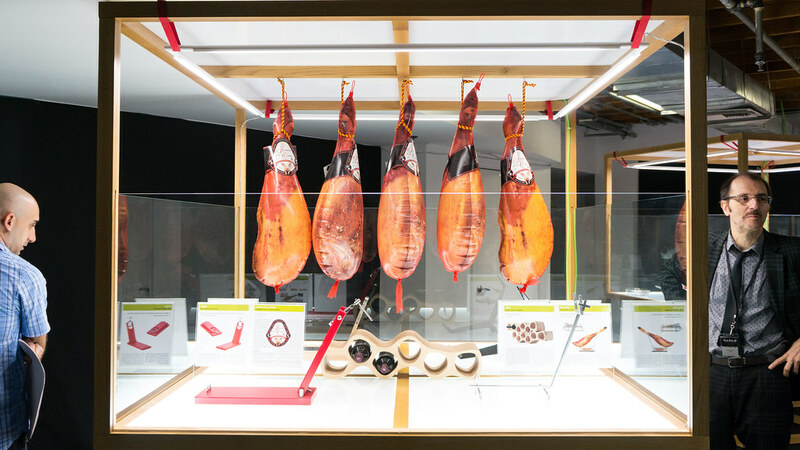 Organized by Acción Cultural Española, and curated by Spanish architect Juli Capella, it's a fascinating glimpse into the circular relationship of cuisine, art, design and culture. (You can see all my pictures in this Tapas - Spanish Design for Food flickr set). 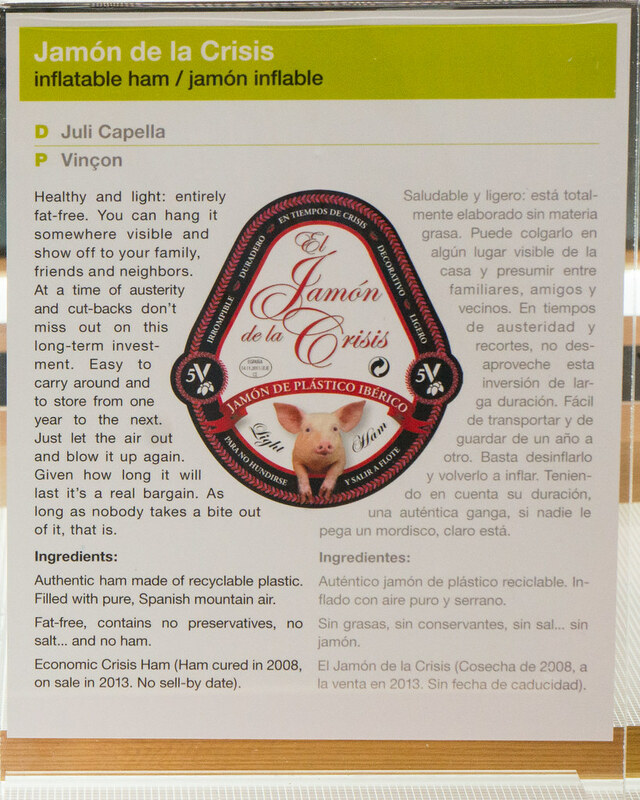 "Jamón de la Crisis" - designed by Julí Capella, produced by Vinçon - one of the most famous of Spain's culinary icons, but in consideration of the recent economic collapse, rendered in recyclable plastic and "filled with pure, Spanish mountain air." "Cured in 2008, on sale in 2013."